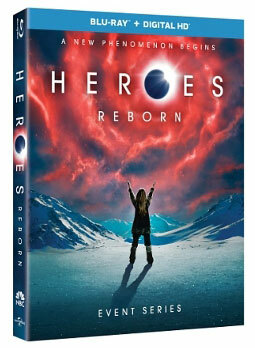 Universal Pictures Home Entertainment has announced the release date for the 13-episode season of Heroes Reborn on Blu-ray and DVD will be April 12, 2016. The Heroes Reborn: Event Series Blu-ray edition will also feature Digital HD copies of the episodes via UltraViolet. Both the Blu-ray and DVD editions of Heroes Reborn: Event Series will include the extras “HEROES REBORN: DARK MATTERS” and “HEROES REBORN: RELIVING THE LEGACY,” as well as deleted scenes from the series. Heroes Reborn: Event Series on Blu-ray is formatted in 1080p at 1.78:1 aspect ratio with an English DTS-HD Master Audio 5.1 soundtrack. The 3-disc Blu-ray edition from Universal Pictures carries an MSRP of $49.99, while the DVD has a suggested retail price of $44.99. New cast members include Zachary Levi (“Chuck”) as Luke Collins, Kiki Sukezane, (“The Port of San Pedro”) as Miko Otomo, and Ryan Guzman (“Pretty Little Liars”) as Carlos Gutierrez, among others.